Interest in antique clocks is growing and the antique clock shop offers an excellent selection of rare and collectable clocks. From the simple alarm clock, which owes its existence to more than 6,000 years of thinking about time and tinkering with devices to accurately mark its passing, to collectable antique clocks that reflect the times and periods of their manufacture. A good quality antique clock is probably one of the best antique investments you will ever make. English Bracket Clocks, Dutch clocks, European Haagse clocks and clocks by English and European clockmakers all in the antique clock shop. A good antique bracket clock is a beautiful timepiece and, providing it is properly looked after, will give its owner immense pleasure and many years of excellent service. The antique clock shop offers a fine selection of antique carriage clocks by well known makers such as, Henri Jacot, Drocourt, Margaine, Pinchon, Paul Garnier and Japy. 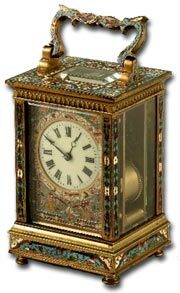 You may even find a nice stock of porcelain panel carriage clocks or Grande Sonnerie carriage clocks which are very hard to find. A well-preserved cuckoo clock from the 18th or 19th century can bring a kings ransom. Selling in auction houses and high-priced boutiques around the world, antique cuckoo clocks are prized for their hand carved scenes, whimsical displays and attractive facades. Fine antique mantel clocks in the antique clock shop. Antique clocks listed include English antique clocks, French antique clocks, early American clocks, French art deco marble clocks and many other mantle clocks at excellent prices..
Find a full range of fine antique wall clocks and dial clocks in the antique clock shop, including Vienna Regulators, Black Forest wall clocks, Lantern Clocks and French Cartel Clocks. Wall Clocks are among the most attractive clocks you will find. Antique Clock Parts for Sale including movements and escapements for bracket clocks, wall clocks, advertising clocks, mantel clocks, antique american clocks and many more. A superb resource for the antique clock restorer. The dating of antique and vintage clocks can be an exact science providing you have the right index books and the proper experience. However, various little things can help when dating antique clocks. Like knowing when certain features were introduced or certain materials became available. Simple things can point you in the right direction and at the correct period for your antique wall clock, advertising clock or bracket clock. 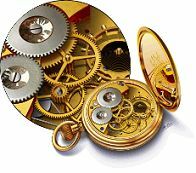 The construction of the various parts will help in dating your antique clock, specifically the style and type of clock hand and the dial, both of which have changed over time. Even the type of material used to construct the clock movement can help, as will determining when the chimes were introduced and the type of chime used.